Not happy with the product you ordered during Black Friday or Cyber Monday? It can happen that the product you ordered at a shop online when arrived and unpackaged is totally not what you wanted. Maybe the product is not as described or maybe you just found out it isn’t that great then you thought. So how to return the product? It is important to know the exact return policy of the shop. When ordering at Amazon, eBay, Best Buy, Target, Apple, and many other online e-commerce platforms the return policy is stated and the exact procedure and the way you are protected as a consumer is clearly described. When ordering at a shop that has its own website or e-commerce platform it is important that you know what their return policy is before returning the product. This to ensure that you are not presented with hidden fees! Law enforced every shop to put these return policies on the website so you should be able to find them. Also first try to contact the store by phone or email if you still have some questions but don’t wait too long! If you are not sure you can always use the product return sample letter provided on this website to ensure that from a legal perspective you are in your right. 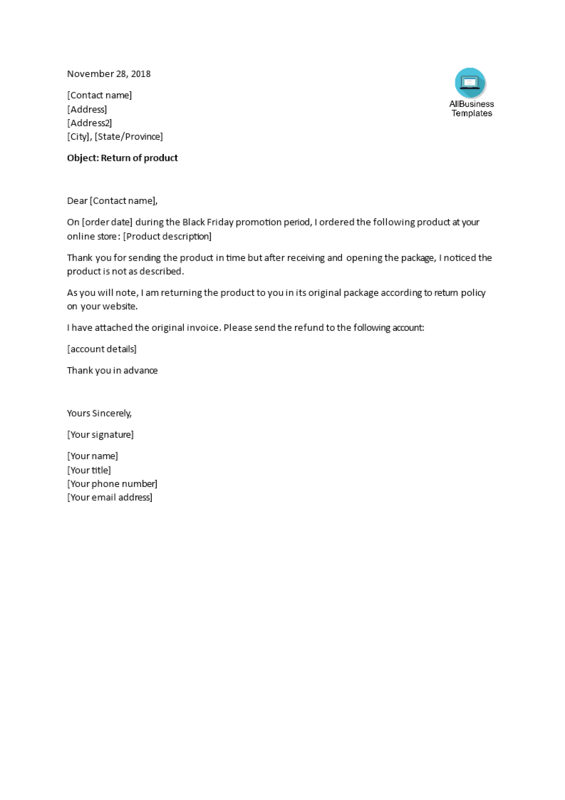 Feel free to download this sample product return letter and adjust it to your needs.